Paisley town centre has been welcoming families from all over for our fun free Easter Trails! 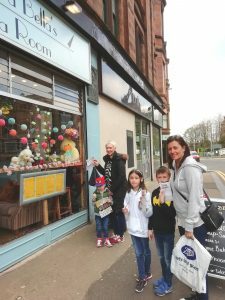 Our Cuckoo in the Nest Trail sees “out of place” items hidden in businesses throughout the town centre. Families are collecting trail leaflets in both shopping centres and local businesses, and completing the list of misplaced items by visiting each business. 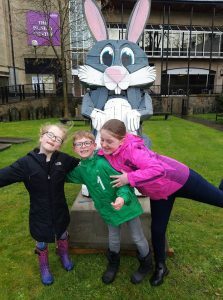 A free chocolate egg is given at either the Piazza Shopping Centre or the Paisley Centre for each child who can show a completed trail form before it’s posted into the designated post-box for the grand draw at the end of the trail. 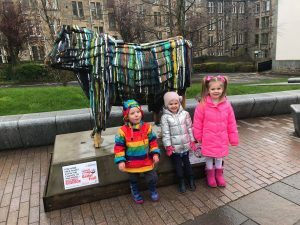 Our second Easter event is a trail of seven animal sculptures located outside throughout the town, all made from recycled materials and carefully produced into stunning works of art. Created by local artist Kevin Cantwell, there iseverything from a Paisley Panda to a Unicorn, which is of course, Scotland’s national animal!